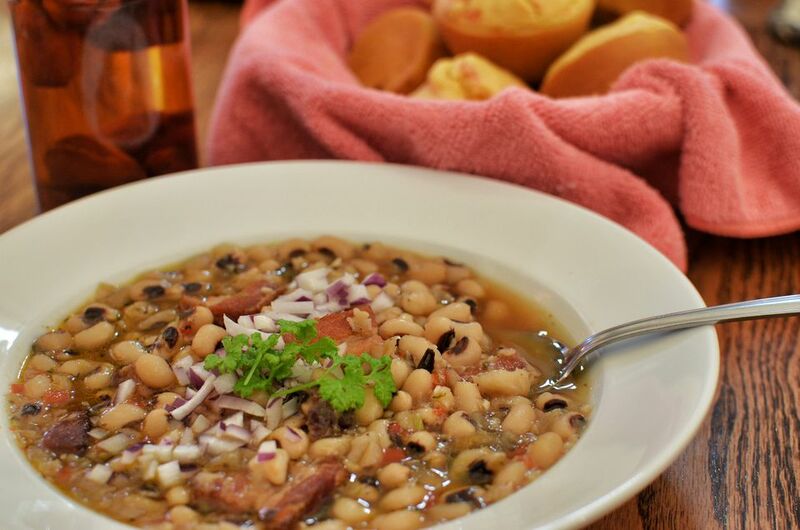 Black-eyed peas are a staple in the Southern states. You'll find everyday peas cooked with spices and meat, black-eyed peas in soups, and even in salads. Black-eyed peas are thought to bring luck when eaten on the first day of the new year, so you'll find people from many regions cooking peas on New Year's Day. The peas are said to symbolize coins, while greens or cabbage resemble paper money, and the pork seasoning is thought to mean prosperity. The cornbread served with them probably stands for gold. Pick the peas over and discard any damaged or malformed peas. Look for small stones, too. Rinse well. Following the package directions, soak the black-eyed peas overnight or follow the directions for a "quick soak." Drain the peas. Cover the drained peas with fresh water and place the pan over medium-high heat. Bring to a boil. Reduce the heat to low and simmer them for about 1 hour longer, or until just tender. Add the peas to the slow cooker with the remaining ingredients. Meanwhile, place the remaining ingredients in the slow cooker and begin cooking on the low setting. When peas are just tender, add them to the slow cooker. Cover and cook on low for about 4 to 6 hours, or until peas and vegetables are tender. Remove the ham bone. Dice the ham and return it to the pot. Taste the peas and adjust seasonings, adding more salt and pepper as needed. The slow cooker makes this an easy preparation to throw together. Soak the peas overnight and start them in the crock pot in the morning with the chopped vegetables and ham bone. You'll be free to go about your day while your meal cooks. Serve these tasty black-eyed peas with hot boiled rice or with coleslaw and greens for a delicious and lucky New Year's Day meal or everyday family dinner. The recipe is versatile as well. Instead of a ham bone and diced ham, use a smoked ham hock (or two if they're small). Or add about 1/4 pound of diced salt pork or bacon to the peas and garnish servings with cooked crumbled bacon. Andouille or another kind of smoked sausage is a good option, too. Slice or dice about 12 to 16 ounces of smoked sausage. Brown it in a small amount of vegetable oil and add it to the peas along with the chopped onion and garlic. For subtle sweetness, add one or two diced carrots.